First of all, to continue some of my thoughts from Saturday….I wanted to report that our cat Samantha is feeling better. She has stopped sneezing, snuffling and coughing. So that’s great news….right now everyone is healthy! Not too long ago, I had been reading different articles and opinions about retractable leashes. A lot of the things I read were against them. One of my favorite blogs, Rescued Insanity, saw both sides of the issue in her post Should We Put the Extendable Leash Behind Bars?, which lead to a pretty good discussion about it in her comments section. I was actually surprised the first time I realized that a lot of people disliked them; we have used this type of leash for years, and were never really unhappy with them….especially when they got smart and replaced the narrow string with a band of webbing, which reduces the chance of injury. I have had that narrow string run along the back of my leg and leave a burn. My sister once got a pretty bad cut/burn on her hand when pet sitting. In time I learned not to let that happen, and then they started making them with the wide web which is much better. Above: on top is the old style with the cord which can be treacherous. I’m not even sure if they make that style anymore. On the bottom is the new style with the webbing, which is much preferable and I think safer if it gets wrapped around anything. I understood the complaints I read about these types of leashes. People using them can have less control of their dogs. However, where we walk our dogs are rural areas where we don’t usually run into a lot of other people or dogs. I quickly “reel ‘em in” when we do. Our rail trails where I walk a lot are wide and open, and I like to give my dogs a little more freedom to explore and sniff things. We have never had an issue with the dogs pulling the leash out of our hand and having the hard plastic handle hit them or anything. I have on occasion dropped it, but it just slid along the ground and I was able to step on it to stop its motion and get it back. On the left: more leash length gives more freedom for wandering and sniffing. I don’t feel like my dogs have to be right beside me every minute of our walk…I want them to get at least some freedom, especially since they are always on leash. I got thinking more about them lately when I was walking the dogs more in our woods. How many times did they get it wrapped around a tree and I had to spend several minutes trying to untangle them? A lot. How many times have I walked with a second person with a dog, where we’ve both had retractable leashes and how many times did we get the lines crossed and get tangled around each other? A lot. My dogs get them wrapped around themselves sometimes too, but thankfully no one has ever been hurt that way. At the same time I am on here mostly defending these types of leashes, I am going to tell you this: I am retiring mine, for the most part anyway. My reasons might not be totally what you would expect though. Back in December I had surgery on my right hand for trigger finger and trigger thumb. The recovery has been slow, but my hand is coming along and getting back to normal. When I was in the middle of physical therapy for that hand, I realized I was starting to have the same issue with my left thumb. I was given a splint to wear at night, and hoped that would help. Lately I have realized that it has been getting progressively worse at a much faster rate than my right hand had. Also, I was having a little more achiness in my recovering thumb. Then, when I was walking one of the dogs one day (which I have been doing much more lately) I had one of those “light bulb” moments. If you use a retractable leash, then you know that you use your thumb a lot to adjust the tension on your dog; to increase or decrease the length of leash they get. I have come to the conclusion that this is exactly what has been aggravating my thumbs! I am not anxious to go through surgery for my left thumb, or even to have the painful cortisone shots that are the first treatment for this condition. The thumb action along with the gripping of that plastic handle cannot be good for what’s ailing me, so I am retiring those leashes. My next concern was that my dogs were going to walk like fools on a shorter leash, constantly tugging and pulling me along. We have two 5 foot leashes that we mostly use when taking the dogs to the vet. I assumed they were used to the freedom of a long leash and that I was going to be spending a lot of time training them to walk on a regular leash. I couldn’t have been more wrong. Yesterday I walked Kobi on it and he was great. Today I took Cricket out, expecting to have to exercise a lot of patience with her while she learned. Not at all, she was great. She actually listens better than Kobi does, when I said “No” or “this way”, she immediately came back to me and went the way I wanted. She tugged a little bit, but it was mostly very gentle. I still have two more dogs to test it with, but I am feeling a little more optimistic for Sheba and Moses now. I also have to say that handling one of those leashes was much easier on my hand, and it gave me much more control over the dogs. Above: Cricket still managed to get tangled a little even on the regular leash. But the untangling was much quicker and she also quickly learned how to untangle herself. So those of you who may be anti-retractable leashes, you now have a new recruit! It may have taken me a while to actually listen to what I had read, and I had to learn for myself, but I have come around to your way of thinking. I plan to buy a little longer leash for when we’re on the rail trail and I want the dogs to have just a little more room to roam. It remains to be seen if my thumb gets better or not, but I am fairly positive that at this point, it will at least stop getting worse! I had a retractable leash for one of our dogs, but I read so many trainers’ advise against them, I tossed it. Lately I’ve been thinking of getting another one, because when we’re out in the field, a five foot lead seems so restrictive. I like SlimDoggy’s idea about short leashes for walking and long ones for nosing around. I’ve really just been finding the shorter leash easier to deal with….but I’m still going to try a longer, regular one and see if that’s still the case. They do make a 12 foot regular leash. I usually use the short leashes to walk in the neighborhood and the long ones to walk on the trails where they can sniff and roam a bit. If SD Jack was a bit more reliable on his recall I’d probably let him go off leash on the trails, but there’s just too many things more enticing than me. Yes, we are working on that! That certainly makes sense. When I am walking along the road I am more comfortable with a shorter leash in case traffic comes along. But for on the trails I am going to try to find a longer regular leash. It seems they don’t make many longer than 6ft though! I was hoping to find an 8 or 10 foot but so far no luck. I think people should use whatever leash works best for them. We almost always use our retractable leashes but we are really good with them and if others are around mom shortens them up. Sometimes when we are 3 dogs on retractables it can get a bit challenging for mom’s hands but we all have our “spot” in the pack and rarely tangle. I agree if you let your dog run you all over creation and don’t pay attention to others they are bad but we don’t have any issues with using ours and since we have to walk on leash it gives me a bit more freedom for off road critter sniffing but we are ok with either type of leash. Your Mom must be very talented, Emma, because I don’t think I could possibly juggle three retractable leashes! 🙂 It sounds like your pack walks very well so that makes it easier for her. I agree, everyone should use what works for them. I wish I’d made the connection too, before I had to have surgery! But I don’t think the leash was the cause by any means, but just an aggravation to a condition I would have anyway. I don’t remember how much I was walking when my right hand got worse….probably at best I may have been able to slow things done some, which is what I hope I can do with my left hand now. We’ll see. Interesting that your dogs don’t pull more on a short leash. I would have expected it. Any tool can be used well or badly. In my city neighborhood, flexi leashes can be a disaster. 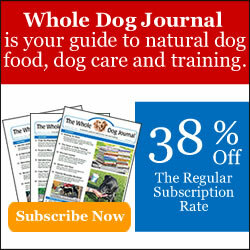 But anyone who is in touch with their dogs can find a number of walking tools helpful. I hope your hands heal and feel better soon. Thank you, Pamela. I was also surprised my dogs didn’t pull more….it wasn’t just a fluke like I was afraid though, I took Kobi out again today and he was still great. Yes, I think often it might be the person behind the leash, no matter what kind of leash it is, that makes it a good or bad tool.